OSC announce details for Scottish Double Header! 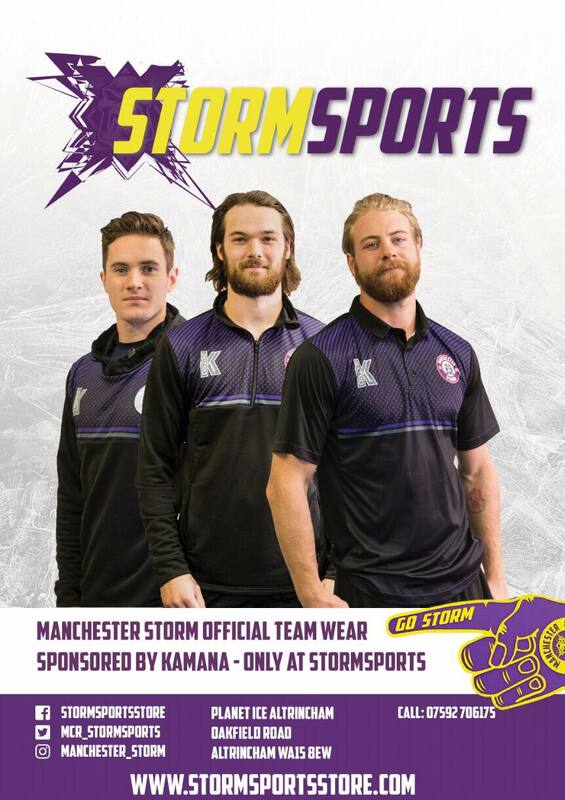 TICKETS: The Go Goodwin’s Manchester Storm welcome the MK Lightning on Sunday the 12th November here at Planet Ice Altrincham in our #Morin15 retirement game! Tickets can be ordered online, by calling the box office on 0161 926 8782, or in person at the box office. 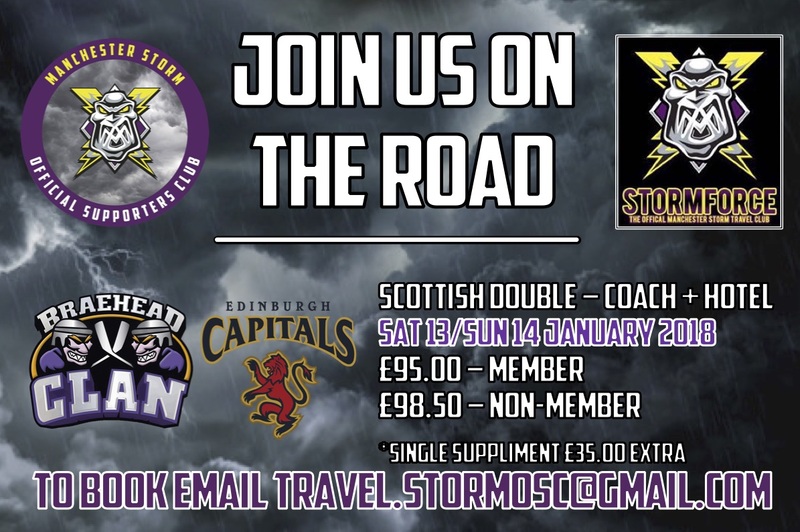 The Manchester Storm Official Supporters Club are excited to announce a fantastic Coach PLUS Hotel offer for our upcoming Scottish Double Header in January. The weekend of 13-14 January sees your Manchester Storm on the road for two fixtures, against the Braehead Clan on Saturday 13th January, and the Edinburgh Capitals on Sunday 14th January. So why not board #StormForce1 and join the boys on the road to cheer them on! Saturday 13th January will see the coach making its usual pickups and setting off from Planet Ice Altrincham at approximately lunchtime. We will then make our way to Braehead for the first of our two games. On arrival in Braehead we will be checking in to the Premier Inn Glasgow Braehead, before making the short journey to the intu Braehead and the Braehead Arena. Following completion of the game, StormForce Travellers will have the opportunity to be dropped into central Glasgow by the coach and enjoy a night on the town in this vibrant Scottish city, the first time that StormForce has decided to stay over in Glasgow! Breakfast is included in your package, and once all travellers have finished breakfast the coach will make its way over to Edinburgh. It is the intention that all travellers will get to spend a good few hours in the centre of Edinburgh before being collected by the Coach and transported to Murrayfield Ice Rink for the second of our two games. Upon completion of the game the Coach will set off back to Altrincham, HOPEFULLY with 4 points on board! All prices are based on 2 people sharing. A single supplement of an additional £35.00 is available on request. Prices have been calculated on a minimum of 35 travellers. All bookings need to be secured and paid for by no later than Friday 15th December 2017 in order to secure our hotel rooms. Any enquiries made after this date will not be processed. If minimum numbers are not achieved by this deadline, a full refund will be offered. To secure your seat please email [email protected]! On your email please include what type of room you wish to book – Double or Twin – and the name of the person you will be sharing with. If you wish to book a Single Room please state as such, and remember that an additional single person supplement would need to be paid. This promises to be an action-packed weekend!! So don’t miss out and book early!! Dallas in the shop tonight!